What do you record on? Protools HD2 - the standard for music and soundtrack production. It combines the highest possible quality with maximum flexibilty. 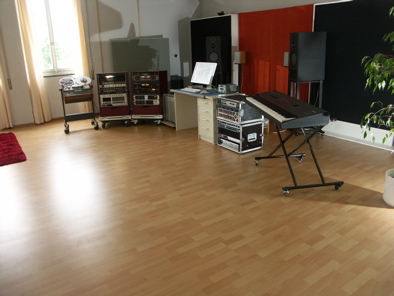 We have enough space for a band, a choir and several soloists to record simultaneously. Call me to discuss your project. I work with fixed prices per song or album or with coaching prices that are comparable to hiring a music teacher on an hourly basis. With years of musical and technical experience, David coordinates freelancers and plans new projects to precisely fit your needs and vision. What is the secret of a great recording? Everything! Every tiny improvement adds up to make the difference between world-class and mediocrity. The combination of high-end analog and state-of-the-art digital tools allow me to efficiently produce recordings that simply sound right. However the key to a satisfied artist is a pricing plan that allows enough time to get the details right.